This fast transmission and driver-free USB 2.0 3 Port HUB helps you to solve many problems, such as WIFI lagging, No internet access,lack of PC interface,Slow transmission speed. Interated fast ethernet Mac, physical clip and transceiver in one chip. Powered by USB port and also can connect external power. Compliant with IEEE 802.3(10Based-T) AND 802.3U (100Base-TX) standards. 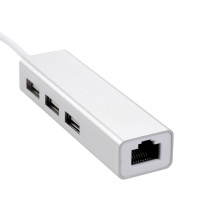 Expand three high speed USB2.0 ports to connect USB devices. Driver-free and plug and play. Compliant with Windows7, Mac OS X.